I can’t think of a better way to spend the cold winter nights than having a comforting one pot warm meal. What more could I ask if its healthy and is packed with nutrients. I love one pot meals for the fact they save time a lot and allow spending time with family enjoying delicious home cooked dinners. Coming to this dish, I’m a self proclaimed hater when it comes to beets. Well that was long back before I realised the sweet, earthy flavor of this marvelous vegetable that I seldom ate as a kid and my mom who desperately was trying at her wits’ end to make me take a bite. Here it is mom, you finally made it! Yay! Victory time. 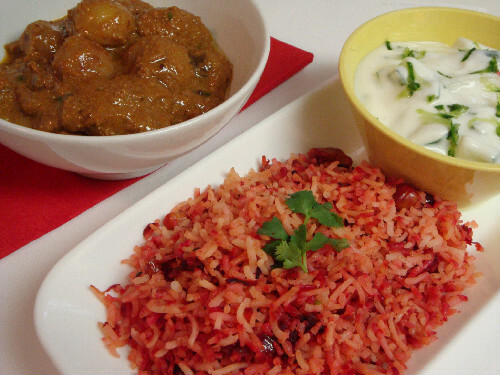 I served this pulao with cucumber raita and baby potato masala curry. Now, the recipes….. In a deep vessel, bring to boil, 10 cups of water. Add 1 tbsp of salt, oil, and the spices (cloves, elaichi, dalchini and bay leaves). Drain all the water from the soaked basmati rice and add it to the boiling water. Let it cook on high flame for about 8 – 10 mts until the rice is just done. Take care not to turn it mushy. Remove and drain it in a sieve. Set the rice aside while you prep up the beetroot mixture. In the same vessel, heat 2 tbsps of oil. On medium heat, add cashew nuts and fry till light golden brown, add shahi jeera, sliced onions, salt to taste and cook on for 4-5 mts till onions turn soft. Add grated beetroot, chilli powder and fry for about 6 mts on medium flame till the raw smell disappears from the beets. Add garam masala powder and combine. Lower the flame, add the cooked basmati rice and gently mix until combined. Turn the flame to medium low and let the rice warm a bit for about 3-4 mts uncovered. Serve it warm with cucumber raita and baby potato masala. Serve cold with a warm plate of pulao. Pressure cook baby potatoes with 3 cups of water for 1 whistle. Let pressure cool off, remove the potatoes, peel the skin and set aside. Heat 2 tbsps oil, add sliced onions, salt and fry on medium heat for about 8 mts till soft and golden brown. Add ginger-garlic paste. Fry for a minute. Remove, cool off, and grind to smooth paste with tomato, coriander powder, cumin powder, methi powder and chilli powder. Set aside. Add 1 tbsps oil, and saute the peeled baby potatoes on medium heat about 5-6 mts till golden brown spots appear on them. Set aside. Pour in the remaining oil (1 tbsp) and let it heat. Add cumin seeds, mustard seeds and curry leaves on low flame. Let them splutter. Add the ground onion paste, and cook on low flame for 2 mts. Add poppy seed powder, turmeric powder, potatoes and combine. Add 1 ½ cups water. Bring to boil. Cook uncovered on low flame till the gravy thickens. Just before removing off from the flame, adjust salt, chilly powder. Add garam masala. combine. Garnish with fresh cilantro leaves and serve hot with plain rice, pulao, or rotis. The combination of recipe sounds great and indeed good for lunch box! treat for eyes and stomach too !! !